Breech vaginal increases the risk of neonatal injury and death, not a lot, but an additional 6 will die and additional babies will be injured out of every 1000 breech delivery. And that’s only if breech vaginal delivery is restricted to a minority of patients who are carefully selected for specific characteristics: baby in the frank breech position at that start of labor (legs folded up against the body, head flexed on the chest and below a certain estimate weight). She had an uneventful pregnancy until the very end, when she found out her baby was breech. All along, they’d been having midwife care and were planning a home birth. … [T]hey sought out one of the only doctors in the state who would permit a breech vaginal birth. He did an ultrasound and attempted a version…then told her that she should show up at the hospital at 8cm and that they would allow her to attempt a vaginal birth at that time. Evidently she and her doctor conspired to circumvent the rules of the hospital by having her show up when it was “too late” to perform a C-section. And she did avoid a C-section, and gave birth to a brain damaged baby as a result. … [H]is brain had gone 9 minutes without oxygen. 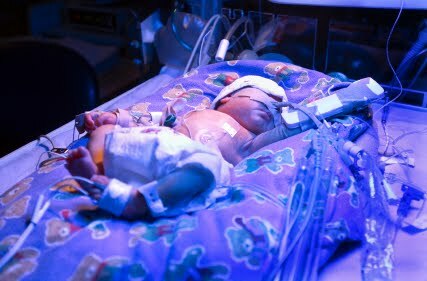 They rushed him to the NICU, and his brain began to swell so they put him on hypothermic treatments. They lower his body temperature and cool his brain for 72 hours in hopes of helping stop the brain injury and give it time to recover…. … [T]hey removed the body cooler and brought his body back to body temperature. They switched ventilators, and he took a few breathes on his own. All his vitals have stabilized, he is pinking up, gaining weight, and having plenty of wet diapers. But they don’t know if his brain has any activity. Unfair? No, not unfair, but a known complication of breech vaginal birth. The mother played Russian roulette with her baby’s brain function and she lost, or rather the baby lost. Was it worth it? The mother avoided a uterine scar and the baby is saddled with serious disabilities for the rest of his life, however long that may be. Had that mother opted for a C-section, either electively or when she showed up in early labor and an ultrasound revealed that the baby was in an unfavorable position, she would not be standing vigil in the NICU hoping that her baby’s brain damage is only “minor” and not severe. She would be home with her new baby bemoaning he “unnecessarean” and whining about how she lost her perfect birth. Instead, she had a perfect birth and ended up with a lifetime of contemplating how she grievously injured her perfect baby.